Big Deal Baptism or Baptism, Big Deal? As we have been reading through the book of Acts we see that baptism is a big deal to the New Testament Church. Over and over we see people believe in Jesus, repent of their sins, get baptized and begin living a new life! Today I wanted to take a couple minutes to talk about baptism. Is baptism a big deal? Yes it is! The first thing they had to do was to believe in Jesus which followed with repenting of their sins and then getting baptized in (or into) the name of Jesus Christ. Baptism is a public declaration; what you are saying is this, “I need Jesus as my Savior and Lord. I will change the way I live. I admit I was going the wrong way and I commit to going the right way. I am covenanting myself to permanently serve Jesus, live the way He commanded and worship Him with my life.” That is the heart of someone getting baptized. We don’t do infant baptisms because infants and small children are not able to make this decision. One way to explain what baptism is to clarify what it is not. Baptism is not a ceremony that gives you salvation. Although the water is symbolic of us being cleansed from our sins, no water can wash away your sins, only trusting in the sufficiency of the sacrifice of Jesus can cleanse sinners. Baptism is not a free ticket to heaven. Although many baptisms are monumental steps for believers, I have seen many people ask to get baptized and it was of no significance because they didn’t have a heartfelt commitment to the Lord. They were just hoping for a quick fix or religious certificate. John the Baptist offered harsh words to people that didn’t understand His baptism. “Prove by the way you live that you have repented of your sins and turned to God.” Matthew 3:8 John knew that the baptism was simply a pledge of a clean heart; the proof of that covenant was in their actions. So as I explain baptism today, it is a pledge to live your life for Christ, the proof of that is not the water; it is the lifestyle that follows. When should I get baptized? If you believe with all your heart and you have repented of your sins (not obtaining perfection but being committed to change), then you should get baptized as soon as possible! If you are old enough to understand whole hearted faith than get baptized now! Even if you have been in the faith a long time but have never been baptized, then get baptized now. If you were “baptized” as an infant then you didn’t make that personal profession so get baptized now! In the Bible there was no test period between confessing Jesus and getting baptized. They didn’t send people to a 4 week class or go home and interview their family, but they did demand a confession and a commitment. The only biblical waiting period is the time between hearing the message and deciding to believe it and follow it. After that decision is made, baptism is immediate. Posted by patrickmccue on September 25, 2013 in Uncategorized and tagged baptism. What is the difference between knowledge and wisdom? Knowledge hears the Word of God but wisdom applies the Word of God! 24… Therefore everyone who hears these words of mine and puts them into practice is like a wise man who built his house on the rock. I have been senior pastor of UBC for seven years now. Nothing is more disappointing to me than when someone hears the Word of God and does not put it into practice. These people learn about the potential of living their life on the solid rock of Jesus Christ, but they chose not to or never get around to doing it. 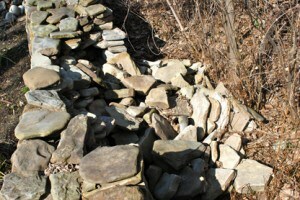 Years ago when I did land surveying I spent a lot of time around stone walls. Some were built tall and wide while others were short and narrow. Some were in great shape while other had tumbled down over the years. I discovered a different kind of wall as well, the one that was intended to be built but was never actually erected. It looked like it had fallen over, but upon closer examination the base stones were never laid. To me this is a picture of the person who hears the Word of God but never gets around to actually putting it into practice. Jesus is the “Solid Rock” (footing or base stone) on which every believer must build. His teachings are the blocks we lay on that footing to build a strong, faithful, unshakable life. He is the only foundation that is unshakeable. So if we are going to build a life that is solid we need to start on the Solid Rock. But after that we need to build with the right materials. This Sunday we are starting our Foundations of the Faith class. I would strongly encourage you to join this class. In this class we are going to talk about the core Biblical beliefs of Christianity that will help you build your faith one solid block at a time. Now these foundation blocks are not set in place only by knowing them, they are only placed on the Solid Rock when we put them into practice. In our class we are going to cover subjects like salvation, assurance, baptism, prayer, The Bible, evangelism, spiritual gifts, membership, worship and more. If you are a new believer or have never attended this class before, I strongly encourage you to come this Sunday morning at 9:00am. We will be meeting in my office. Don’t be the guy that intended to build a stone wall but never got around to it; start this Sunday by building your faith one block at a time! Now some of you will be saying “I know these subjects and have been a Christian for a long time.” My question to you would be this, “How well do you handle life’s storms?” If the storms of life leave you shaken, upset, devastated, bewildered or so forth, something is wrong. I know no one is perfect but a mature Christian knows how to rely on the Solid Rock during life’s storms and doesn’t get blown around. I encourage you to have your foundation checked, get back to the basics of the Christian faith and join this class. God has given us everything we need in His Word and when we learn it and put it into practice we no longer fear the storms of life because we are standing strong on the Solid Rock! Posted by patrickmccue on September 13, 2013 in Uncategorized. I got a really nice e-card yesterday celebrating my 7th year as Senior Pastor of United Baptist Church. The majority of our current congregation was not around to remember that special day, August 27, 2006, but I want to thank all of you that were there and that believed in me. A few people doubted that I could lead or preach but the majority was really excited to see what God would do in the coming years. I had a great setup to start off successfully. The previous pastor had radically changed the culture of the church for the better. Before he came to UBC the Bible was optional but after his time here the congregation believed in the power of the Word of God. I was the youth pastor when he started so I stood alongside him as he pushed for change and saw a dead church come back to life. I thank God that I didn’t have to start at the bottom but instead had the honor of starting on the shoulders of a man of God that poured himself out for this church. When I took the reins God had started something special but we still had a really long way to go. Truthfully, when I started I didn’t have what it would take to get us to where we are today, but I knew who did. I prayed for so many issues that I couldn’t figure out what to do with. I brought the problems to my elders and as we prayed, God started to give us clear answers and most of the time, He would just do an intervention before our eyes. A few months before I was called to be Senior Pastor I took a couple of days alone and went up on top of Monument Mountain in Great Barrington, MA to pray. As I sat on a rock all day and spent time with the Lord I wrote this promise to God in response to His calling me. I vow to serve you fully. I vow to live a surrendered life. I vow to live a pure life. I will be strong and courageous. As I look back seven years later I can see how these promises shaped my ministry. Over and over again I reaffirmed these promises and saw how God would use me as I sought Him. In those early days I had two scriptures that really shaped me and helped me survive. The first was about the ancient paths, which reminded me that every time I came to a crossroad, I needed to ask God which way to go. Instead of making up a plan, I would choose the tried and true plan! The second verse had to do with my challenges and challengers. When you receive the calling as a pastor you are agreeing to follow the Lord and lead the sheep, but many people take it on themselves to meet you with a leash and try to chain you to their own agenda. I had my share of the petty attacks, the petitions, the sabotages, etc but they were really of no concern to me because God had directed me and prepared me for adversary. I meditated on this verse over and over and while some people attempted to chew me up and spit me out, I wasn’t terrified or discouraged. I knew God would bless my steps and cause them to fall, so simply stayed faithful to him. And sure enough as I walked in God’s footsteps I kept seeing giants fall to the right and to the left. As I look back on the last seven years I am amazed at how much has changed and how far we have come. I am committed to this church and more than ever I am excited to dig in and follow the Lord closer than ever before. After seven years many pastors burn out and move to another church but I feel like we are just about to catch fire! God has done so much but I feel like He has so much more He is trusting us to do for Him. As we come close into His presence He will show us the way to abundant life! I want to encourage you to press in with prayer and commitment. Maybe even adopt the four promises I made with God seven years ago and get ready as God does something amazing in His people here in Ashford! Posted by patrickmccue on August 28, 2013 in Church, preaching, Uncategorized. On Monday Rachel and I made good use of our day off by going grocery shopping. After picking up some stuff we stopped at Wendy’s for lunch. As we sat down to eat, a grease fire ignited under the hood of one of the grills. One employee screamed “fire!” and literally ran for the door with her hand flailing. As she turned to corner of the counter and started pulling the door, the fire was already out. One of the cooks had a much different response; he simply put the fire out. Life will always be full of storms, some people run screaming while others put out the fires. We will not fear, because we know who our refuge is! God is our hope and our help and when we lean on Him, it makes all the difference in the world. Sometimes God stops the storms in an instant, and other times He rides the storms with us, but he never abandons us. Maybe you have been stuck in a storm for so long you are losing hope. Often times we start to lose hope because we focus too much on the storm and not enough on our Savior. If that is you I want to encourage you to take this verse and let it change you! At the end of the day I want you to know where your help is coming from. Storms are a fact of life, but we can praise Him in the calm and praise Him in the storm! Casting Crowns wrote an awesome worship song that can help us as we go through the storms of life. Here is a link to a YouTube video of it. I hope it blesses you and helps you to prepare for the storms of life! Posted by patrickmccue on May 22, 2013 in Missions, prayer, Spiritual Growth, Stewardship, Word of God. On Sunday we looked at a powerful scripture that taught us about the power of prayer. Peter was in prison and the next day was the trial that would certainly have convicted him to death, but God answered the prayers of the Church and set Peter free. Over and over the Bible teaches us about the power of prayer. God moves in supernatural ways and it is almost always preceded by prayer. Peter miraculous escape from prison is a great example of the power of a praying Church. His friends and followers knew what they needed to do when Peter was in trouble. They prayed and believed that God would save him. It seems like there are more people around me than ever before in desperate need of prayer. We can pray for the salvation of someone that is lost, and God can use the prayer to bring them to Him. We can pray for the sick and see God touch them supernaturally. We can pray for those that are emotionally hurt, depressed and scared by past hurts and God can use those prayers to comfort and restore them. I find in my life that I often struggle with actually praying. Sometime I think about praying and I think about all the people that need help and I fail to actually pray. God doesn’t want us to only know we can approach him with prayers, he wants us to actually do it and do it with diligence. “Keep on asking, and you will receive what you ask for. Keep on seeking, and you will find. Keep on knocking, and the door will be opened to you. 8 For everyone who asks, receives. Everyone who seeks, finds. And to everyone who knocks, the door will be opened. Today I want to encourage you to not think about praying, but take the time to actually pray. Pray bold and believe that our awesome God has GOOD GIFTS for us. On Thursday we have the National Day of Prayer and we are meeting at the Ashford Town Hall at 6:00pm. I hope you will come as we pray for the nation. Our theme prayer is the one God told Solomon to pray when the nation was broken. Can you image the power of God at work answering the prayer that Christians will be praying all across the nation? At times I might shut up the heavens so that no rain falls, or command grasshoppers to devour your crops, or send plagues among you. 14 Then if my people who are called by my name will humble themselves and pray and seek my face and turn from their wicked ways, I will hear from heaven and will forgive their sins and restore their land. 15 My eyes will be open and my ears attentive to every prayer made in this place. Lastly, if you are not a part of our prayer email team I encourage you to join it. This is a way that you can pray for those around you that are in need. Also if you have a prayer request, please submit it and get the prayer support of the Church. Remember, Peter was in trouble, BUT the Church prayed! Posted by patrickmccue on May 1, 2013 in Acts, Church, prayer, Uncategorized, Word of God. Have you ever been doing something and then in the middle of it you felt like someone was watching you and then as you got up and turned around sure enough someone is staring at you? The devil is constantly patrolling the earth keeping a watch on you. He has his workers watching you and he himself is looking all the time. The devil’s plan is the steal, kill and destroy you (John 10:10) so he is prowling around like lion and patrolling around like a watchman checking up on your life. The way I picture it, he often cruses right by when you don’t look too dangerous, when life is status quo. Other times he stops and notices you. What does he notice? He notices two things, either you are growing and being effective for Christ or you tripped up and vulnerable. He hates it when you are effective and wants to stop you, and he kicks you when you are down to eliminate you. He seems to attack the most when you are in one of these two situations. The number one rule of war is to know your enemy, so as Christians we need to understand that the devil is out there and that he wants to harm you. On one of these patrolling adventures the Devil noticed a guy by the name of Job. We have a whole book of the Bible about the attacks, the struggle and the restoration of Job. At the begging of the story Satan tells God that he watching what is going on and God asks him if he noticed Job. I know many of you have felt like Job at one point in your life. You felt like the devil noticed you and he wouldn’t relent in his attack on you. Maybe you feel that way now. Many times that is exactly what is happening. The devil noticed that everything is going great for you and you are walking blamelessly with integrity and the fear of the Lord or he noticed that you tripped up and he wants to hit you while you are down and make you feel worthless, pressuring you to quit. If you’re like me you wondered why God would let the devil attack Job so severely, or even more, call attention to Job. First of all the Devil had already noticed Job, but it was pointless to try to afflict him because God had him completely shielded and protected. God then removed this protection and let Satan test job. There are a lot of reasons God lets us be tested, but I will just briefly mention one of them. Tests, trials, and trouble develop our faith. The testing of your faith is the very thing that strengthens it, so after the battle is over you become a great warrior for Christ. If there was not a battle then God wouldn’t have been able to show you how great He is as the faith deliverer! This is what God ultimately does with Job. Dear brothers and sisters, when troubles come your way, consider it an opportunity for great joy. 3 For you know that when your faith is tested, your endurance has a chance to grow. 4 So let it grow, for when your endurance is fully developed, you will be perfect and complete, needing nothing. James 1:2–4. I want to encourage you today. If you feel like the devil noticed you, don’t be afraid of him. He wants to get you but so does God, so run to God! Pray, learn and trust God in the heart of the trial. God allows every trial you face because He wants you to grow! So I say grow! If you do, you will bloom on the other side of it! Posted by patrickmccue on April 24, 2013 in 04-2013, Spiritual Growth, thanksgiving, Word of God. On Monday our hearts were broken as we heard stories and saw pictures of the effects of evil in this fallen world. Evil and deceived hearts are capable of abominable behavior so it should be no surprise that we see such things. Although the Bible clearly teaches that the human heart is wicked and needs redemption most people in our society believe that all people are automatically good unless something bad corrupts them. This view will lead people to play the blame game because after all, people are good. The Problem must be guns, TV, video games, music or lack of education so let’s make laws to fix it. I am all for good laws, but I don’t believe that mankind can protect itself from its own evil. God already made the perfect set of laws in the Old Testament but they proved to be incapable of preventing the human heart from sinning. Because of this God implemented a New Covenant with man by sending Jesus to pay the penalty for our sin and offer us forgiveness. Although few subscribe to the Old Testament law today, many are chasing an unclear pursuit putting blind faith in humanity and believing that we can heal ourselves and protect ourselves. Psalm 127:1 disagrees. At times I might shut up the heavens so that no rain falls, or command grasshoppers to devour your crops, or send plagues among you. 14 Then if my people who are called by my name will humble themselves and pray and seek my face and turn from their wicked ways, I will hear from heaven and will forgive their sins and restore their land. God taught us throughout scripture that if things don’t seem to be going well around us, then it is time for us to repent. We are called to admit our weakness and call upon his strength. We are called to pray, not to send positive thoughts. We need to know who He is and pray to Him! Then seek His face and change from lukewarm living into righteous obedience! If our nation repented like this we then God would look from heaven, forgive our sin and restore our land. Unfortunately most people look to man, government and laws for the answer. Last week in our House to House group we began praying John 6:44 over each other and over our town. I implore you to join me and pray it over Boston and over our nation. The only hope we have is Jesus. I know that and you know that, but most of Boston and most of our nation doesn’t know. Let’s pray that God would draw them to Jesus and that they would find redemption in Him. Times are bad and people know it, so let’s show them who to put their hope in! Posted by patrickmccue on April 19, 2013 in Uncategorized. Does God answer prayer? I think you know what my answer is going to be, but I had a real eye opening experience last Wednesday at our House to House meeting. We were watching a video about answered prayer and after listening to a missionary’s testimony about God answering prayer, I realized how miraculously God had moved in my life. I don’t know about you but I often pray a lot of little prayers. You know what I’m talking about right? God help me concentrate, help me pay a bill or help me make it through the day. Other times I think these are too small to pray so I don’t even bother to say them to God. They are simple prayers that seem like they are not that important or really matter, or do they? As we were talking about prayer I recognized how God had answered a small prayer in my life but its effects were big! In 2010 Rachel and I signed up to go on a mission’s trip to El Salvador. We had only been married for a short time and we were really strapped financially at the time since Rachel was unable to find a full time job. God had blessed us with a great place to live for a really sweet deal but in the dead of winter we were surprised by heating bills of almost $800 a month. We thought that God had been calling us to go on this trip, but when it came time to get our deposit in, we didn’t have any money to do it. Linda Adcock had also signed up to go on the trip with us but was in the same boat because she unexpectedly found herself unemployed. Do you think God was in this? Yes, but not for the reason you might think. In my natural wisdom I was thinking that it was time to pull the plug on the trip, but at the same time we all felt called to go. With the registration deadline approaching we realized that if God didn’t supply the money we wouldn’t be able to go and so we prayed a seemingly unenergetic yet sincere prayer appealing to God. As the deadline came God had mysteriously (through unexpected people) provided just enough money to pay the deposit. We considered canceling the trip anyway since we had two thirds of the amount to raise still with no real plan on how to get it. We decided that since God had provided it we would register and trust that God would supply the rest. We sent out support letters and waited. It was now time to purchase our plane tickets and the price was going up every day. We prayed again, “Lord if you want us to go, you are going to have to make a way.” Sure enough, we mysteriously (through unexpected people) received just enough support to purchase the plane tickets. We almost didn’t buy them because we didn’t think it would be possible to raise the rest of the money. Sending our deposit to the mission’s organization wasn’t too big of a risk because even if we didn’t go they would be able to use the money to the glory of God, but how foolish would it be to spend $1,500 on plane tickets that couldn’t be used? We prayed a little, unenergetic, sincere prayer and felt led to purchase the tickets. If God brought us this far how could we turn our backs on Him? He had provided exactly what we needed, and that is what we had asked for. As the final deadline came for our money God had worked several more mysterious, miraculous provisions and we were only several hundred dollars short. As we shared this story with a friend she pulled out her check book and said how much? We laughed out loud. It was laughter of joy, embracement and confidence. Joy that God had provided, embracement that we weren’t sure that He would earlier, and confidence that we know knew He would and now certainly did provide! We miraculously were able to go on the trip and did a lot of great things but something beyond that happened. Linda had her first exposure to El Salvador and because of that, she later went back for the summer and shortly after that, she permanently moved there to serve God as a missionary. Why am I telling this story? What would have happened if we simply said, “I guess we can’t go” and instead of praying about just canceled the trip. We were very close to doing that. If we didn’t pray, then God wouldn’t have released the provision; if God didn’t release the provision than Linda might not have ever gone on a mission trip and if she never went on a mission trip, she probably wouldn’t have become a full time missionary. I was wrecked and nearly in tears when I realized this at our House to House meeting last week. I realized how close we were to not even praying that prayer. All week I have been realizing how often I take the cards I’m dealt instead of asking God for a new hand. When I hit a dead end I often give up instead of pray. I believe that He cares about the small stuff, wants us to pray about the small stuff and then uses it in a huge way. In our video series Mark Batterson says “Every blessing, every breakthrough, every miracle, and every dream has a genealogy. If you trace it all the way back to its origin, you will find a prayer circle.” I agree with what he says but unfortunately Christians don’t think this way. It’s true that God takes care of the flowers in the fields and that He will take care of us, but He is also our Heavenly Father and He teaches us to approach Him as our father and ask Him for breakthroughs, miracles, blessings and more. Last week I went before God in prayer and asked boldly for a soul harvest this Easter. I prayed that He would use our service to reach people’s lives. On Friday night and Sunday morning we had a combined attendance of around 260 people (including volunteers/choir) and nine people confessed Jesus as their Lord and Savior for the first time. What if I didn’t boldly pray that prayer? What if my House to House group didn’t pray that bold prayer with me? Those people might not have trusted their lives to Christ. I believe the saddest thing about prayer is the number of prayers that go un-prayed. I don’t think God is in the business of answering un-prayed requests. However God is a loving father who has good blessing for His children. Let me encourage you today to pray. Don’t only pray over huge issues, learn to pray without ceasing. Bring all of life’s issues to God and you might be surprised at how He will answer them! God certainly does answer prayer! Posted by patrickmccue on April 5, 2013 in 3-2013, Missions, prayer. Ekklēsía which means “called out.” God was building a people that would come out of the world and come and worship Him! Most of the world rejected Jesus, the Church was those that heard the call to salvation, and came to worship Jesus as Savior and Lord! Now as they grew in Christ they met together in large groups (like we do on Sundays) to hear the Apostles teaching, but they also met daily in each other’s homes. When they went house to house they were able to pray together, share communion together and disciple one another together. They knew each other’s needs and helped to meet those needs. I really and truly believe that if the Church is going to be strong and fulfill the call that God has on it, we cannot just be an association of believers that rendezvous on Sunday Mornings. Rather we need to be a community of diehard Christ followers that worship together and disciple one another in everyday life, or as Acts puts it, going house to house. There is no way that the Church can reach its mission if it’s only active on Sunday and there’s no way you can stand strong for Christ if you are isolated Monday through Saturday. We need to stand together, grow together, worship together, and serve together. I long for a day when we cancel almost all of our formal ministries because those needs were being met in authentic, organic community. Not something that had to be organized, but something that was in the DNA of our members because the “call” of Christ was so strong, they came “out” and met it! The Church isn’t a building and the Church isn’t a worship service. The Church is the people of God, “called out” by name, worshiping the Savior and fulfilling the “Great Commission.” If all Church has ever been to you is a meeting place, then I want to challenge you to take it to the next level. Come out of your everyday routine and join a House to House group. Discover what it is to worship God beyond the white building with pillars and a steeple. Worship Him Acts style and go House to House! 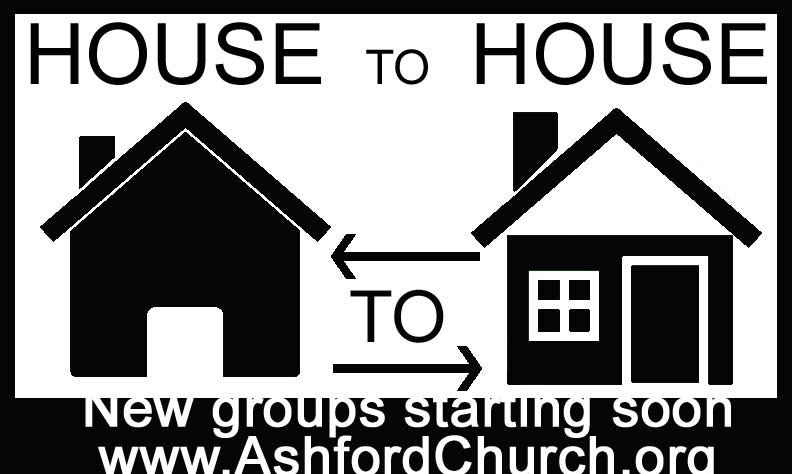 You can join a House to House group by going to www.Ashfordchurch.org. I bet you will be surprised at how much it helps you grow in your faith and service to Christ! Posted by patrickmccue on January 17, 2013 in 01-2013, Church, Uncategorized and tagged church, house to house. For thousands of years people had been waiting for their Messiah to come. He had been prophesied as far back as Adam and Eve and His appearance had been desperately awaited. Generation after generation had felt the burden of sin and had hoped with all hope that they would see their Savior come. Isaiah the prophet wrote the above promise that a Savior would come. He would be a “Wonderful Counselor, Mighty God, Everlasting Father, Prince of Peace.” Peace was something that had rarely been experienced throughout history and the promise of peace was more than they could imagine. Jesus was born in a time of enforced peace; it was a peace that only produced a lack of war. The Romans ruled the world and no one was strong enough to challenge them, so there was peace. The peace they enforced was only an external appearance of peace, but on the inside, the Jewish people were in distress. The peace that Jesus came to bring was a peace that went far beyond external circumstance, the peace He came to bring was peace to the soul and spirit! He came to forgive the sin that creates division between God and man and to bring wholeness and rest to one’s mind and spirit. This peace is achieved only through salvation. The salvation Jesus came to bring was not from earthly governments, it was from the stronghold of sin and the judgment that un-forgiven sin would face. If you have ever been charged with a crime, whether you did it or not, you know the weight of judgment. The promise of this Savior was to bring a peace (true peace) that had no end! 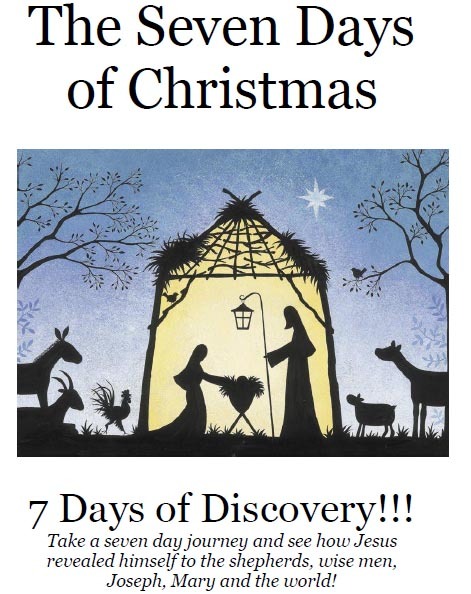 Posted by patrickmccue on December 18, 2012 in 7 Days of Christmas, Christmas.